Green-striped burrowing frogs are not typical frogs. They can be found in drier environments, such as woodland, cleared land, and drier forests. 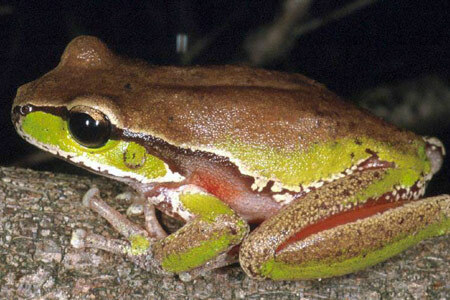 The male Green-striped frog calls from beside temporary waterholes after periods of heavy rain. Their call has been described as a loud and rapid quacking sound. These frogs can remain underground for up to seven years while they wait for the rains to come. They form protective cocoons by shedding their skin repeatedly. These skin layers form a waterproof shell around the buried frog, preventing them from drying out. These frogs will eat anything they can fit in their mouths. This is normally insects and other invertebrates, but they will also eat small lizards and mammals, and even other members of their own species! In captivity, the green-striped frog can develop a very strong feeding response. The Green-striped frog will try to eat anything in front of them that moves, including unwary fingers! These frogs are sometimes mistaken for toads. Not all frogs are green! The Green-striped burrowing frog can remain underground for up to seven years while they wait for the rains to come. They form protective cocoons by shedding their skin repeatedly. This forms a waterproof shell around the buried frog, preventing them from drying out. In captivity, they will try to eat anything in front of them that moves, including unwary fingers!